All kidding aside, our affiliate program has the elements that spell opportunity and great long-term profits. First, we sell exceptional products. 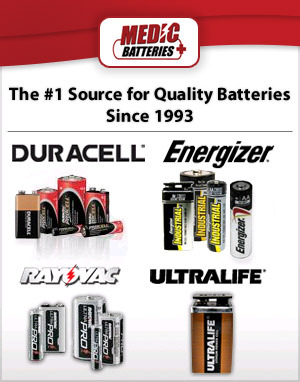 We are one of the largest bulk consumer battery retailers online, and we carry only world-famous brands—like Duracell, Energizer, Rayovac, and Ultralife—that have the reputation and quality to speak for themselves in the marketplace. Second, you’ll be associated with a great company. Medic Batteries has been in business for 17 years and continues to grow every year. We’re a family-owned company that takes great pride in delivering honest and spectacular customer service—the kind of service that keeps customers coming back to our site. We have a large and loyal customer base of professional, high-volume users—corporations, government agencies, theaters, production and touring companies, houses of worship, and non-profit organizations—as well as a substantial number of households. We offer commissions of up to 10 percent (and our average order is $130). We have a 60-day cookie, to get you the full benefit of return buyers. We have dedicated internal program management with fantastic affiliate support and accurate commission reporting. We pay bonus commissions to high performers. We actively promote our product with fresh creatives, monthly coupons, and promotions. We are a parasite-free merchant, so every commission you earn is your commission. And, of course, the program is free. In short, our affiliates have the tools, support, and structure of an industry leader. And just think about it … a product like batteries, one that everyone needs, every day, at work and at home, is exactly the kind of product that makes for a successful affiliate. Contact the Medic Batteries affiliate program leader at affiliate@medicbatteries.com or at (800) 479-6334. Medic Batteries does not allow the bidding or use of it's branded trademark terms by affiliates engaging in paid search advertising in any search engine, e.g. Google, Yahoo, Bing. Please refer to our agreement and the SAS PPC Bidding rules or complete list of Medic Batteries' protected terms and brands. No DTM (direct to merchant) PPC is allowed. Your paid ads must not link directly to our site, all paid search ads must take visitors to your site, not ours. We require referral tracking information. Any affiliate using link cloaking should contact us to discuss at affiliate@medicbatteries.com or (800) 479-6334. Any affiliate with more than a few transactions without referral tracking (“Page Banner was Clicked From:” is blank) will be investigated further. If no response is received from affiliate, transactions will be voided and affiliate will be denied further access to our program. We are pursuing affiliate marketing as a way to gain new customers and are happy to pay a commission to anyone bringing in new business. It has been our experience that affiliates who use practices such as PPC bidding on our company name are only capturing our current customer base and piggybacking off our other marketing efforts. As a result, any transaction resulting from one of our current, established customers will be voided. A current, established customer is any person or business which has ordered from our company more than once within the last year. We encourage legitimate forms of advertising and promoting our website. If you have any questions regarding our terms, please do not hesitate to contact us. Please note: any transaction resulting from a violation of our terms will be voided and the affiliate will be denied further access to our program. If you have any questions or comments regarding the Medic Batteries Affiliate Program, please feel free to contact us at affiliate@medicbatteries.com or call us at (800) 479-6334.